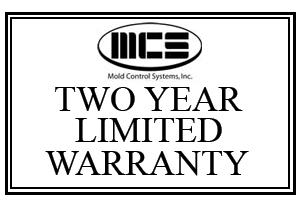 Mold Control Systems, Inc. guarantees its temperature controller units to be free from defects in materials and workmanship for a period of two years from the date of delivery. If the unit should malfunction, it must be returned to the factory for evaluation. Follow return procedures listed in the "Terms and Conditions." Upon examination by Mold Control Systems, Inc., if the unit is found to be defective, at our option, it will be repaired or replaced at no cost to the customer. Mold Control Systens, Inc. holds the right to void the warranty of the controller at our discretion. Signs of abuse or tampering are found. Incorrent fuse has been used. Accidental application of high voltage rated over the system's usable specifications. Accidental application of high voltage to thermocouple inputs. Warranty does not cover: contact points, fuses, or triacs. All shipping/freight costs to and from Mold Control Systems, Inc. are to be paid by the customer (no COD's accepted). A standard fee will be applied to all repairs not under warranty. Please call for details. Mold Control Systems, Inc. accepts no responsibility or liability for the APPLICATION by the customer of temeprature controllers. This liability is assumed by the customer. Upon inspection, if the returned product does not meet our warranty requirements, customer may be subject to a reasonable service charge. there are no warranties, expressed or implied, for temperature controllers except as stated herein. In no event shall Mold Control Systems, Inc. be liable for consequential, incidental, or special damages beyond our control. The buyer's sole remedy for any breach of this agreement shall not exceed the purchase price paid by the buyer to Mold Control Systems, Inc.